Ironman Arizona is one of the best venues for an Ironman when you consider how close it is to Sky Harbor airport, the town of Tempe and the fact that your fans can see you at least five times during the race. With it’s ease of accessibility and multi-loop course, Ironman Arizona is the perfect late season race. If you are a first time Ironman, this is a great course, as it’s not an ocean swim, there are multiple loops on the bike that are ‘hill free’ and then run is relatively flat with a couple of quick hills. All in all, there’s no wonder that this race fills so quickly every season! 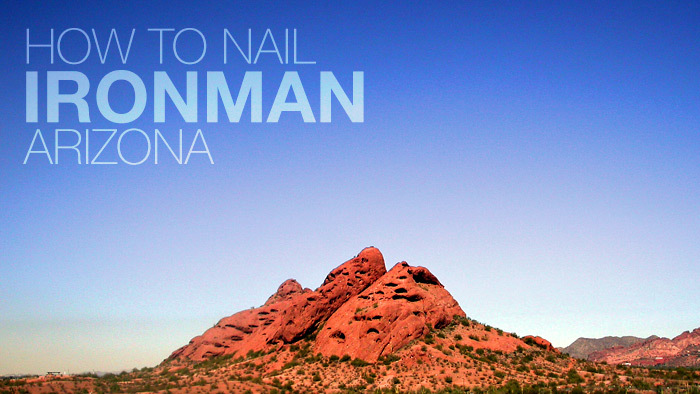 Ironman Arizona is one lap swim. The water temps have been in the low 60’s due to the river that feeds into Tempe Town Lake. The swim does start into the sun, so that can be frustrating and makes using a draft even more important. If you get to the front early, you’ll have to tread water for a bit, which will keep you warm as you wait for the start. You’ll have to sight more often but if you can swim straight and stay on those feet in front of you, it will be a quick swim. From the start line to the last buoy is not a perfectly straight line, so keep sighting! The finish is tricky as you have to climb up aluminum bleacher style steps. There should be volunteers there to help pull you out and wetsuit strippers as soon as you hit dry land again. Check out age grouper Keith Trammell’s swim – notice his line throughout the swim. He stayed with the curve of the lake and came out around 1:06. Not bad for a first time Ironman! Total TSS: 291 – Keith used a negative split effort, raising speed and power each lap. See Trammell’s full power file. If we break the race into two part, the first half was 160 average power and 143 average heart rate and the second half was 167 average power, with a 139 average heart rate. Keith was able to lift the power while keeping the heart rate the same. The only way an athlete can do that is if they are properly fueled. The key to riding well in AZ is being able to ride in the aero bars for long periods without sitting up and ruining your aero position. This will allow you to get the most benefit out of this flat and fast course! I highly recommend coming into T2 in a light gear that you can spin easily and even a few seconds of standing on the pedals to loosen the legs for the run. The Arizona run course is two loops for 2014, the same as it was in 2013. In years gone past its been a 3 lap course. The key to this course is getting fluids down at the aid stations and taking the first 8.5 miles relatively easy. These are the flattest miles of the course and it gives you an opportunity to get your fluids in so take advantage of that. Don’t forget the air is pretty arid in Tempe, so you’ll get dehydrated even though you feel fine, so you have to pay attention to your hydration! The hill at mile 9 or so is at Papago Park. It’s not a long hill but it will let you remember you are doing an IM and that you just biked 112 miles. Keep your effort steady, no need to crank it up this hill. You still have 16 miles to go once you get to the top and you get to run the hill again too. Looking at Trammell’s run from 2013, his first lap was at a 152 heart rate average at an 8:18/mile pace and the second loop was at a 153 heart rate average at an 8:41/mile pace. See Trammell’s full run file. As you can see although Keith lifted the heart rate his pace was falling off. Many times we’ll see a drop off of 30 secs to 1 minute per mile. The fact that he only dropped 23 secs per mile is a testament to his strength and conditioning. Obviously his nutrition and hydration had to be in dialed in as well. The only recommendation I would make here is that Keith start a tad slower next time – maybe in the 8:25 range with the hopes of dropping down to 8:35 pace. The net time may have been the same in the end, but the overall effort to get there would have been less work. In terms of run training, this course is a fast one so the more long runs you do that are flat it will benefit you. Add in some hill repeats each week and you’ll be ready to hit this course steady and strong!